The Estes Viking is one fantastic research model rocket with 48 possible different fin configurations! Each kit in this educational bulk pack gives you five special die cut card stock fins that allow you to create a rocket that's a truly unique rocket of your own design! Take your pick on how you want your rocket to look; fins up, fins down or fins whatever way. You call it, it's your day to be the rocket designer! Customize your own rocket...no matter how you place the fins, it still offers the ultimate in high performance model rocket flight! Retail $84.99 SAVE 23% ! "Great Educator Pack for Starters"
"Viking rocket for junior high summer camp"
Best to use the A engines for easier recovery, especially in limited space, since this has a streamer instead of a parachute. Fins are a bit easier to apply since they a card stock instead of balsa, but not quite as sturdy as other models. this rocket is very very good rocket if your just starting off. My science teacher got these for us to build and now he has got me hooked on them! now im on level 2 but this rocket is what got me into the madness! there is one exception though the fins are kinda hard to put on but other than that and as long as you follow the directions you&apos;ll be fine! Easy build. With 12 pack you can change fin configuration and colors. Will post photos. 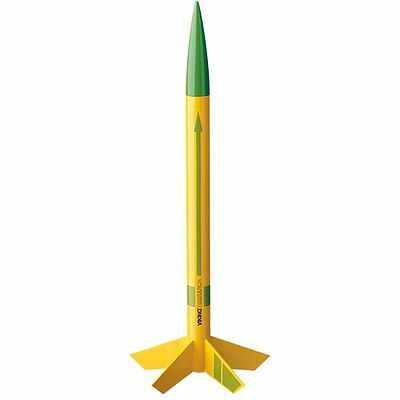 This Skill Level 1 rocket kit includes a single piece body tube, molded nose cone and self-stick decals. This rocket is just over 12 inches (25.4 cm) tall. When flown on standard rocket engines, the Viking is able to reach amazing launch heights over 1650 feet (503 m) and land safely with its bright orange streamer. The versatile Viking can be built in an afternoon. It's a great high altitude rocket for beginners, class projects, clubs and rocket demonstrations.